Welcome to the Tales Of Phantasia Shrine! You can find all the info you need about this game, one of the last released for the SNES. This game was later re-released for the PlayStation, but many things were changed. You won't find info on the PSX version here; sorry! ToP spawned two sequels for the PlayStation: Tales of Destiny and Tales of Eternia. 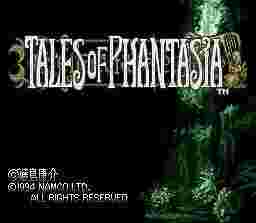 You can download and play Tales of Phantasia for your PC. The game has now been translated into English. For the necessary files, check out the Download page. DeJap's translation for the game has been done in a fairly rebellious mood: i.e., you'll find coarse language and adult material in there. Play at your own risk. April 11, 2005: dhsk232 sent in a tip about cornering Dhaos with Soul Forge in the first fight against him. January 2, 2005: Detailed world map put up, courtesy of Tropicon. December 5, 2004: A mistake fixed in the Techniques section thanks to Brian. November 25, 2003: New maintainer for the shrine! Please don't bother Cidolfas with e-mails anymore and direct all shrine or game-related comments/questions to Cless Alvein! July 15, 2003: Cless Alvein went through the shrine again and fixed stuff based on the scrutiny of MegamanX2K, Weiila, Xachariah, Aidyn_Wolf and Marlow. A big thanks to you all! December 21, 2002: Cless Alvein went through the shrine and fixed any mistakes he saw and put up table backgrounds. October 16, 2002: 77Crono77 sent in the fact that Acid Rain actually lowers enemies' defense, not speed. Thanks! March 13, 2002: The full walkthrough has been taken down due to bandwidth issues, sorry! You can read the first-part and second-part walkthroughs, but not the whole thing at once. Hopefully this'll be remedied eventually. January 14, 2002: A huge update; I finally played through the entire game using DeJap's patch, and corrected a slough of errors. I practically rewrote the walkthrough from scratch. I also added entirely new maps (of much higher quality than the others) of Dhaos's Castle (Future). Also added six new SPCs to the zip file (three from the bass lines when you play the drum set, two from the ending (oddly, two other music themes wouldn't save properly) and one from the piano kid in Venezia). December 26, 2001: Antonella Remaggi sent me a bunch of corrections to the Combo Command key sequences. Soce, The Elemental Wizard mentioned that upward slashes can also be upward thrusts; he also gave me a tip about how the Lipstick item works. POMEX sent in another Easy Money trick in Aegis' Shop. DoiNk mentioned that equipping both the Dark/Demon Seal and Combo Command still lets you use techniques. May 9, 2001: Lanzz sent me a neat trick to help you build levels in Ymir Forest in the later part of the game. It's in the Secrets section. March 28, 2001: Wildfire pointed out that you can get the Mecha Blade combo in Beladam via a secret passage. Second update: That guy with all the ?? ?s let me know that the Diamond Ring doesn't protect against Thunder-Elemental attacks. February 13, 2001: DeJap has released another version of their patch, and this one has a few name changes. Chess Piece Face was kind enough to send me a list of them and the site has been changed around to reflect them. TransTech has also released an alpha (very buggy) version of their patch; once we get a decent working one, I'll add another version of the shrine for it. January 28, 2001: Thundergod e-mailed me the offsets for learning techniques; check the Hacking page. January 22, 2001: Site is now completely accurate with the DeJap patch (I was working with an older version), especially the Enemies section. January 14, 2001: Updated the site to concur with the new DeJap patch. July 1, 2000: Added some interesting info by the S-Flag and Blue Crystal Rod items. June 29, 2000: Fixed up a few minor things; added one more Secret; added two more points in the walkthrough: one which lets you keep the Knight's Sabre sword and one which explains what the musicians in Past Euclid do. Also added PSX character pics thanks to DeJap Translations. June 27, 2000: Shrine created.